There may be differences in buying a home in the Greater Bluffton South Carolina Lowcountry U.S.A. versus what you may be familiar with in your home state or country. We want to be sure you aware of a few important things which we have summarized in the list below. 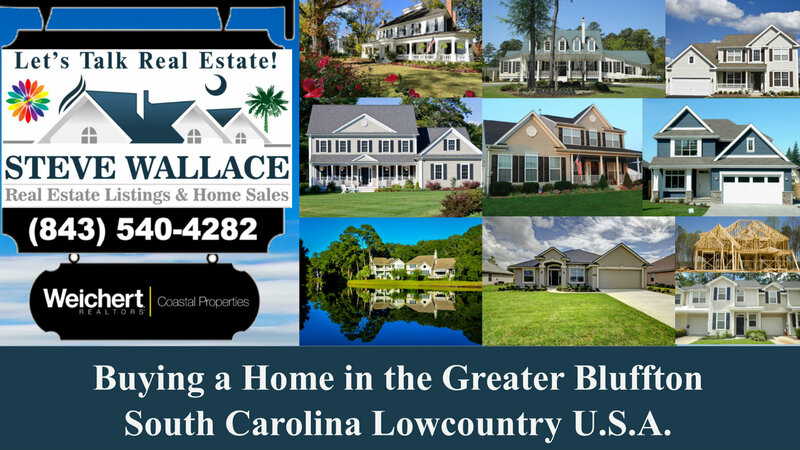 Speak with your local Purveyor of the South Carolina Lowcountry Lifestyle, Steve Wallace, Realtor and Accredited Buyer’s Representative (ABR®), to schedule a free home buyer consultation in one of our local offices. Steve will review the list below with you and have a chat about your home goals. Steve is anxious to show you our wonderful selection of homes and vacations villas to make your own. These homes are located in top destinations of the South Carolina Lowcountry which include Beaufort, Bluffton, Callawassie Island, Hilton Head Island, Okatie, Sun City Hilton Head and areas beyond. An attorney licensed in South Carolina must handle and be present at all closings. Closing does not take place simultaneously with the buyers and sellers. Each party closes his/her side of the transaction in his/her attorney’s office and funds are distributed through the buyer’s attorney. This allows time for both parties to check their HUD-1 closing statements in advance to be sure everything is correct. Transfer Fees may be incurred when selling a home in some communities. Be sure to check if the home you are considering has any community transfer fees. In South Carolina, assessed value is determined by Point of Sale value. Your taxes can be calculated based on your purchase price at www.bcgov.net using the online services tab. Be sure that you understand property tax – 4% Owner Occupied, 6% 2nd Home/Investment. You can learn more about tax exemptions available to you on www.bcgov.net. Be sure to get a home inspection on any home you are purchasing. You should know the condition of any home you are considering. The contract of sale is written instruction as to how the closing is to be handled. It is important to understand the agreement before it is signed, so review your contract with your Realtor® and your attorney. Understand your insurance costs. In most cases you will need wind and hail in addition to a Homeowner’s Policy. Buying a Condominium which we call Villa - Speak with the Regime Management to verify the monthly regime fees which allow, for the most part, for maintenance free living. A variety of local townhouses and townhomes also have monthly regime fees and these properties can be great lock and leave vacation homes or permanent residences. Verify neighborhood property owner association (POA) fees and any other fees with the POA or management company in the neighborhood. Ready to buy or sell a local home? You WILL receive a free real estate consultation to discuss your Greater Bluffton, South Carolina home buying or home selling goals from a veteran agent and member Realtor® in NAR. Bringing over a decade of local real estate experience, Steve has time-tested, tried and true systems and procedures in place to help you achieve your local real estate goals. 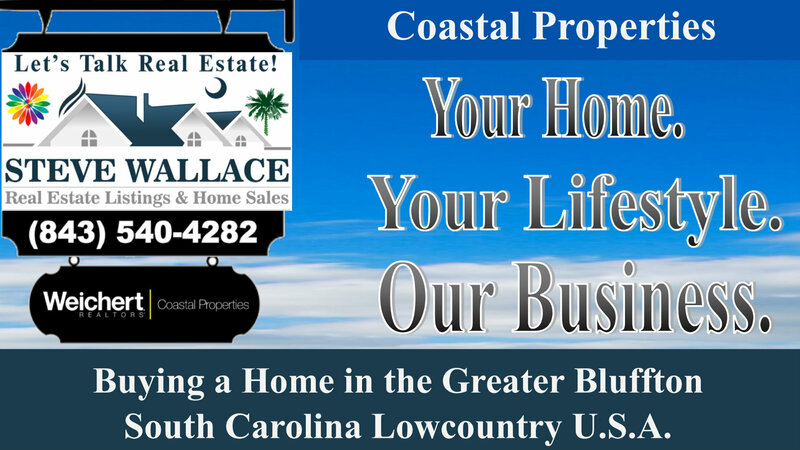 As a decade long Bluffton South Carolina resident, USC graduate and full-time Realtor® bringing years of experience, Steve Wallace has his finger on the pulse of Greater Bluffton, South Carolina, the neighborhoods, developments, and all facets of the real estate market. Steve has built long term relationships through advocacy, commitment and by careful listening, planning and attention to detail. He can help you locate top local real estate professionals for lending, legal, home inspection and insurance services from his list of local real estate service providers. He provides an unpretentious, professional, friendly, straightforward and trustworthy approach. Steve believes in real service for real people. 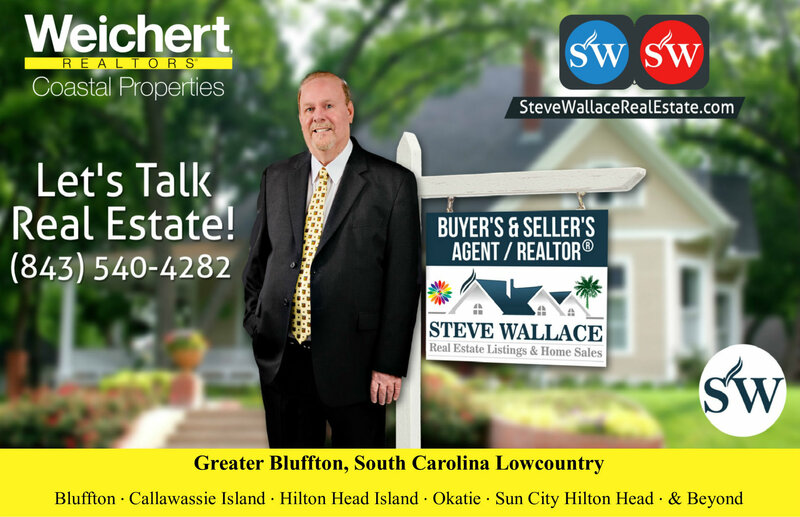 Steve Wallace is at your service for Greater Bluffton real estate in Beaufort County and Jasper County, South Carolina, U.S.A..
Buy Homes and Sell Homes with confidence. home purchase and sales process.